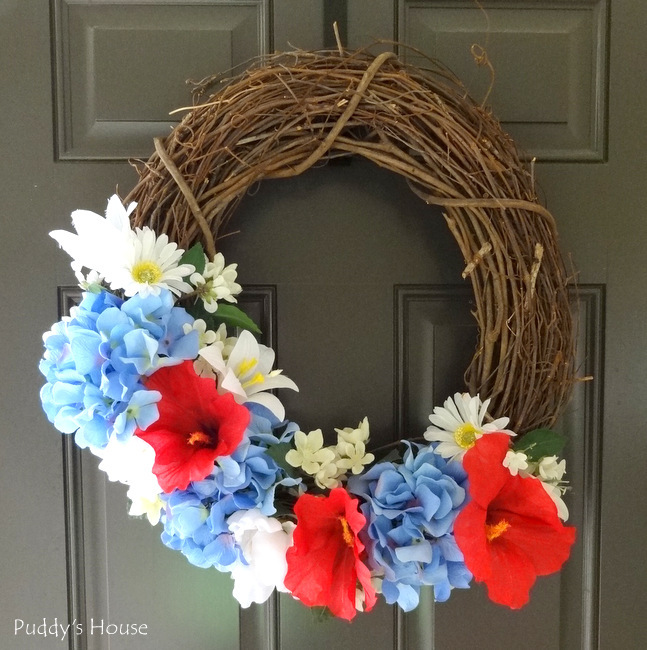 If you’ve been around Puddy’s House for any length of time, you know I have a thing for making wreaths. 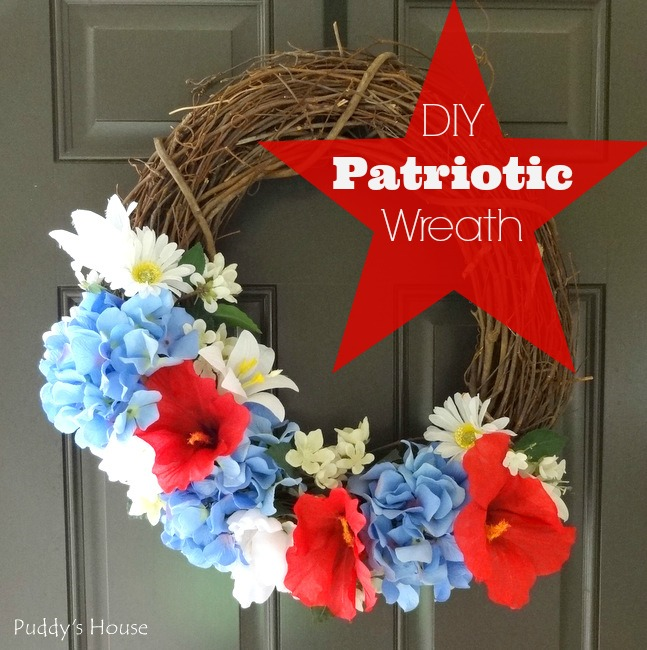 The idea for this patriotic wreath came when I had my fabric purchases in hand in the checkout line at Jo-Ann Fabrics and I spotted these bright red flowers and the nearby sign that said 70% off. 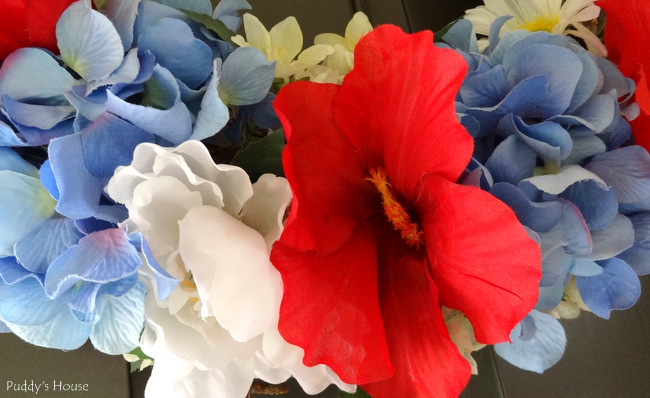 I quickly cut out of line and went over and grabbed the red flowers and hopped back in the checkout line….this was all on my lunch break, so it was quick! 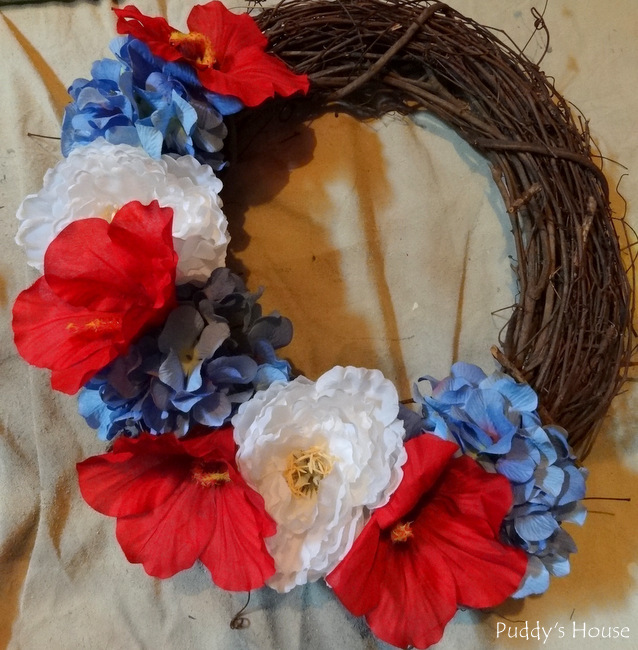 I knew I had some of the blue hydrangeas and plenty of white flowers at home, so I thought combining them for a patriotic wreath would be nice for all the summer patriotic holidays. 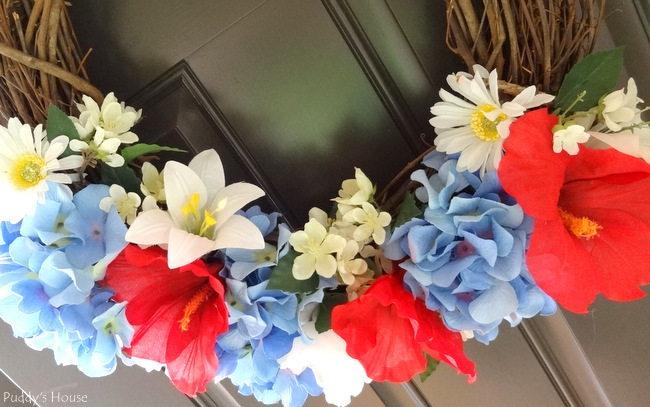 I took the multiple flower options and a empty grapevine wreath. 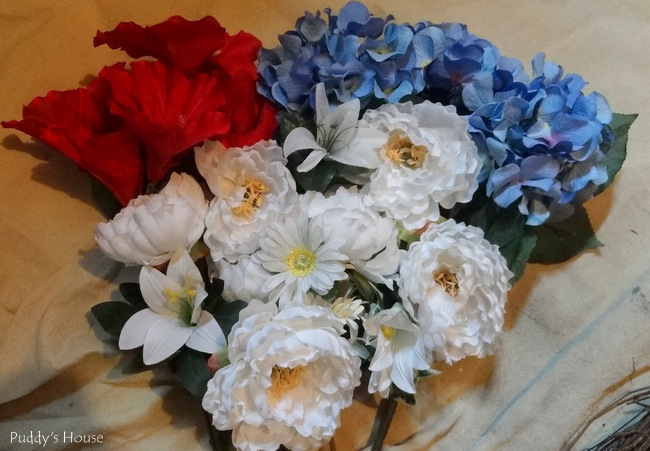 And, I started with some of the larger flowers of all the colors. Definitely wasn’t working…the flowers were all too big. 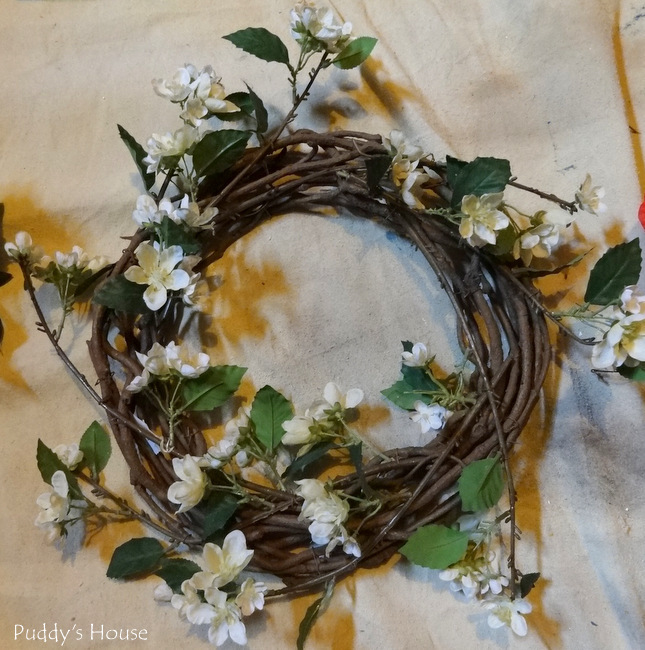 I dug out some smaller white flowers, and I also found another wreath in my stash. I wasn’t planning to use the wreath, just the little white flowers. 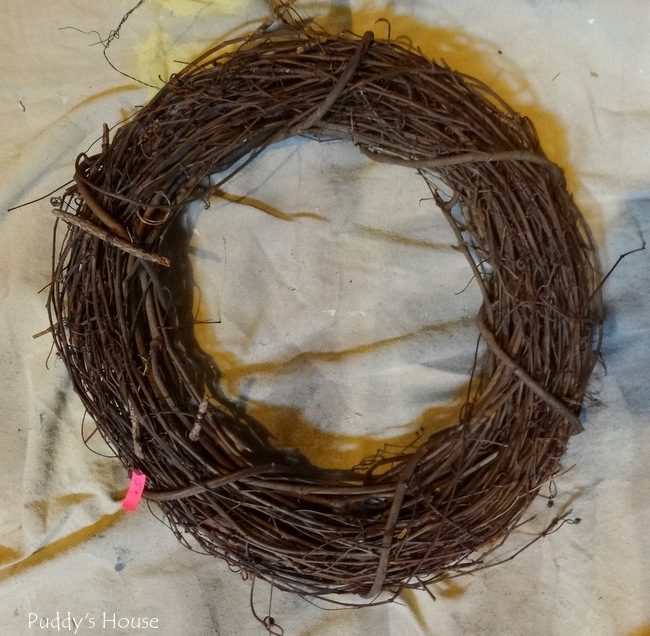 So, I disassembled the wreath, which was easy as the stems were just stuck in and occasionally wire tied to the grapevine. 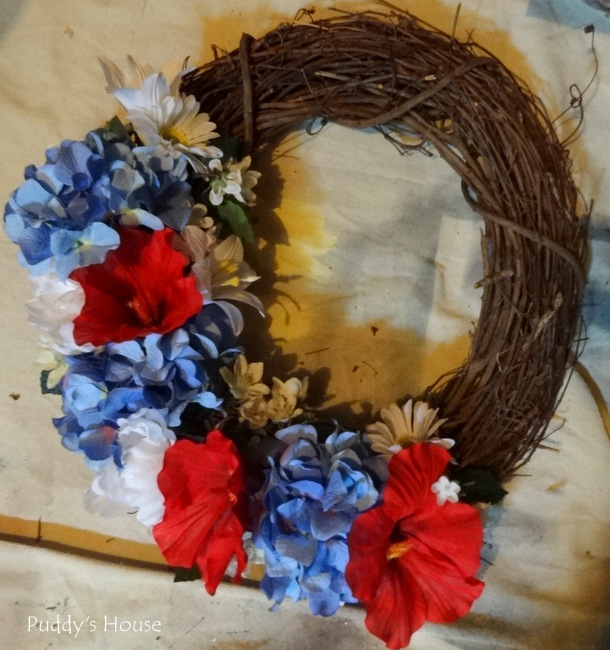 After I added some smaller flowers and changed it up a bit, I thought the wreath was looking pretty good. It is always hard for me to tell when I’m working on it, especially now that I’m working in the basement…the lighting isn’t as good as I would like. But, the basement space is certainly nice for the messes I tend to make. 😉 So, I carried the wreath upstairs and hung it on the door to check it out. I was pretty pleased with it. Bob thought maybe it could use something on the other side. I did try adding a flag and even adding ribbon and patterned fabric and didn’t like either. I still may add something on the other side, if I find the right thing. But, for now I like it. So, what do you think, would you add something to the other side? If so, any ideas?